I'm a little obsessed with notebooks. I usually have one with me everywhere and I fill it with notes and lists, but it often has doodles, collage and some drawing in there too. I have found that ideas are everywhere and they generally start from very small observations. Even the most boring ones, can be inspiring to look back on, as memories can often trigger a new idea that develops into something different to the original observation. So I encourage you to give it a go....but be warned it's a little addictive! Planning things you want to make, paint, do, achieve, etc. Writing stories, poetry, songs, etc. Keeping notes about places, you've been, things you've seen. Recording, observing, spending time looking, paying more attention. 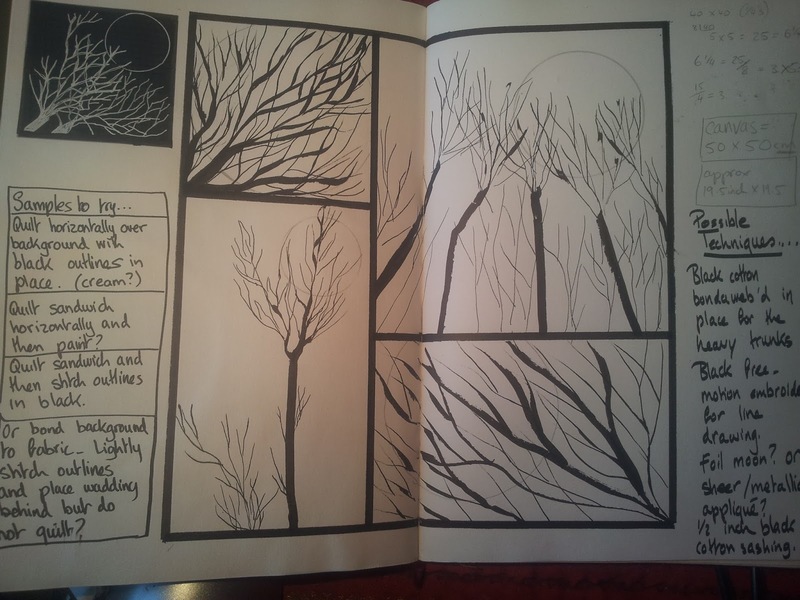 You might buy a beautiful artists sketchbook, or a very plain student notebook. 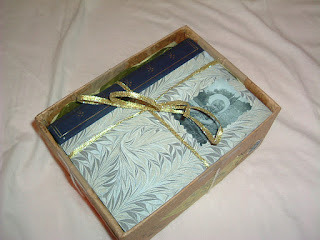 You might take an old copybook or notebook and paint over the writing. 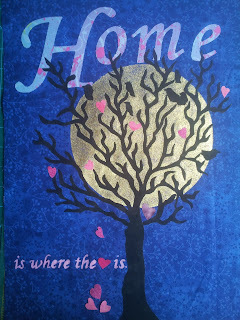 You can use a book found in a charity-shop and re-purpose it, taking inspiration from the words printed on the pages. The cover might inspire the contents, or the contents might inspire you to decorate the cover. Anything goes....it's yours now, make it your own. You can leave your cover until you Fill some or all of the pages, and your book begins to take on a life of its own..
Have some kind of window/door in it with something behind it. Add Gesso to the cover to create texture for painting. Layer the edges of your pages so that you are glimpsing an element of the next page as you are reading the current page. 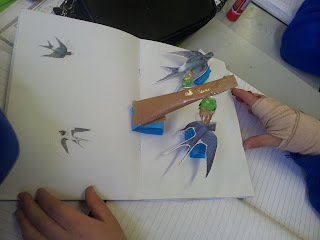 Adding pockets or envelopes to your book provide an opportunity for adding notes, photos, sketches that allow the reader to interact with the book and become more engaged with the narrative. Glue two pages together to form pockets. Add clear plastic pockets to allow you to see the contents. Colourwash: Mix paint with good amount of water and use large brush to colour page. Sponging: Use a sponge to dab paint over page. Wax and wash: Wipe blank page with wax crayon or candle and colourwash over it. 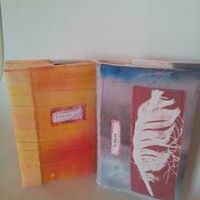 Dripping: Drip or pour diluted paint onto page and fold paper or another page over it. Clingfilm wash: Paint onto piece of clingfilm and press page onto it. 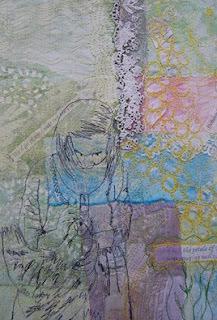 Stencil: Paint over lace, netting or paper lace to stencil pattern onto your page. Ink rubbing: Use a make-up sponge to dab ink from a stamping pad onto your page. 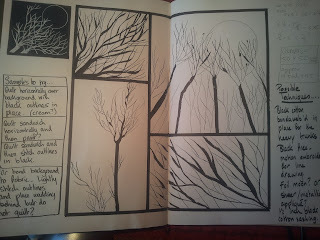 Spread your sketches across two pages with one image, theme or colour scheme to lead your eye around the page. Mask over something, paint the page, remove the masking. How to trick yourself into drawing! Look at the object. Put your pen down on the paper and start drawing without looking at your page until you finish. This stops you from criticising what you are doing. Turn the picture you want to copy upside down and draw the lines you see. This stops you from drawing what you think you know about the thing. Put tracing paper over the picture and just trace it. This allows you to learn how to draw the lines you see. Put a piece of the picture on your page and continue to draw the lines outside the picture onto your page. This gives you the confidence to finish something that’s already started for you. Cut out the shape of something from a picture and outline it on your page. Use a thick marker to outline the shape of something in a picture and copy that outline onto your page. Paint, pencil, crayon, marker, gel-pen, wax, ink, ink stamping, chalk, pastels, etc. Silk wall-hanging inspired by the stone walls of County Galway. The above are some of the stitch samples produced, and I sincerely hope they found the class useful in helping them begin to find their own visual language so that they create unique textile artwork. On Sunday 24th from 14.00 to 18.00 I will teach a workshop in Creative Textile Art. 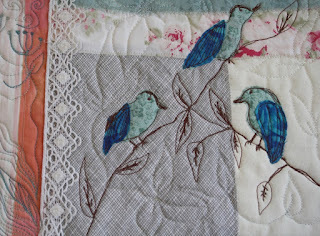 In this class I will share with you ideas, prompts, tools, materials and techniques to help you develop your own style of textile art. 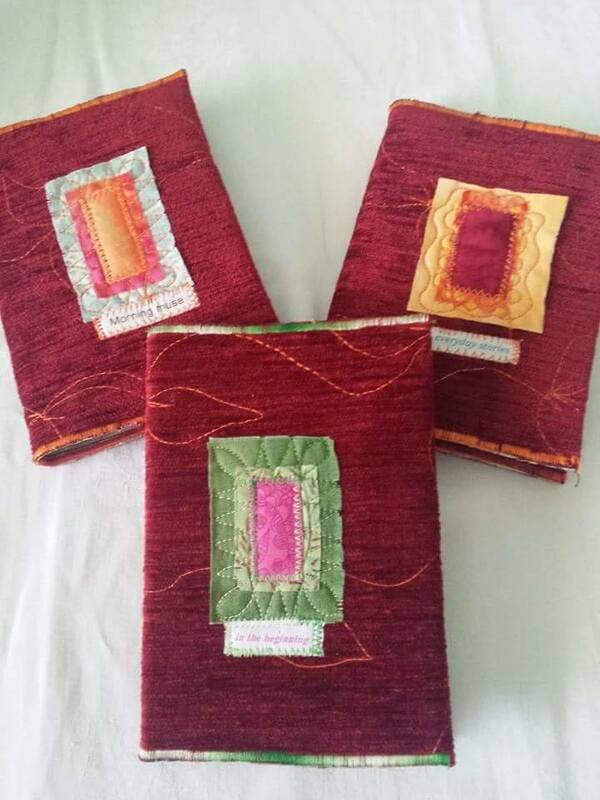 I will introduce you to my making process and resources so that you can take these basic skills and begin your own creative journey to making textile art that is meaningful for you. 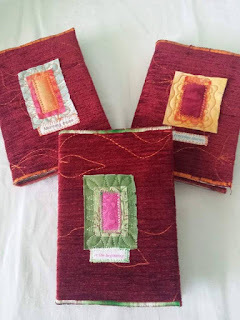 I hope this introduction to textile art will provide you with the encouragement to explore fabric and stitch as a means of personal expression. Give me a call on 087 6193870 or email me for further details. Remember, for updates on this and other workshops, give my Facebook page (Ester Kiely, Textile Artist) a like! I used a selection of pink, mauve and neutral buttons from my stash, threaded them through with waxed linen cord and tied in a knot after each one. I used sliding knots for the closure so that you can put it on over your head and then pull to shorten or lengthen to the position you prefer. Off to raid the button stash some more, Christmas is coming and the list is long! It's time to think about Christmas presents! Christmas on a budget can be stressful, but it doesn't have to be. This year my motto is make, recycle, thrift, re-purpose. With this in mind I started thinking of those short straight waiter-style aprons that always look neat, comfy and don't restrict movement. I like the way the strings are long enough to wrap around and bring to the front. You can use this to tuck in a tea-towel. I decided to make them using 2 coordinated cotton prints and make them reversible too. 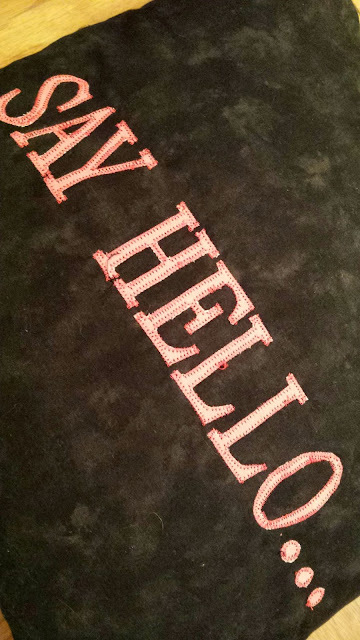 I added lace trims, a nifty pocket and a couple of printed words for a little extra detail. I've made a start on the present list.....but there's still a bit to go! 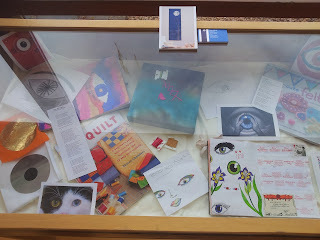 Hand-dyed fabrics, vintage lace, free-motion embroidery, fabric painting and machine-stitch sketching are just some of the techniques used to create this frame-stretched piece for the exhibition "Art is a Wound Turned into Light" at NUIG for Mental Health Week, which opened on September 30th 2015. This piece was a slightly new direction for me to explore. I enjoyed allowing the piece to evolve in the same way as I treat a page in my sketchbook. I just gathered fabrics and lace scraps in my studio and allowed the piece to evolve as I worked. Working in this way is all about enjoying the process and not worrying about the outcome. 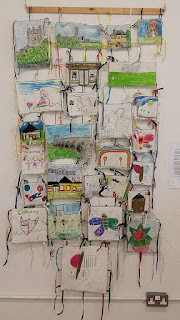 Galway Culture Night: "Building Claregalway"
A wall-hanging created with the help of some local children for Culture Night at Cruthú Studio in Claregalway on the 18th September, 2015. The children used fabric crayons to depict something about their life in the community, I quilted each one and we used recycled ribbons to tie them together. We talked about the connections between people, communities and interests and how this makes life interesting. I love creating something new with the help of young artists like these. 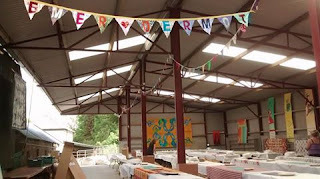 Cruthú Studio is owned by artist Elaine Cunningham and Culture Night saw the studio come alive with face-painting, millinery, mixed-media art, music, poetry, stilt-walking, paper-craft and textile art. What a vibrant arts community we have! 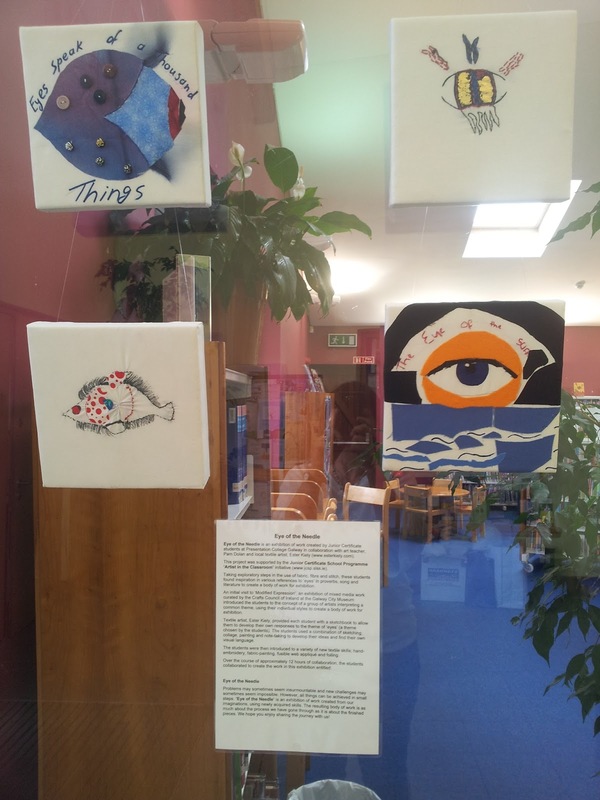 A number of local artists have come together for a pop-up shop at Cruthú Studio, Claregalway for the month of August. Pop in and see the range of work available for sale. I enjoyed helping to decorate this barn for my friends' wedding. 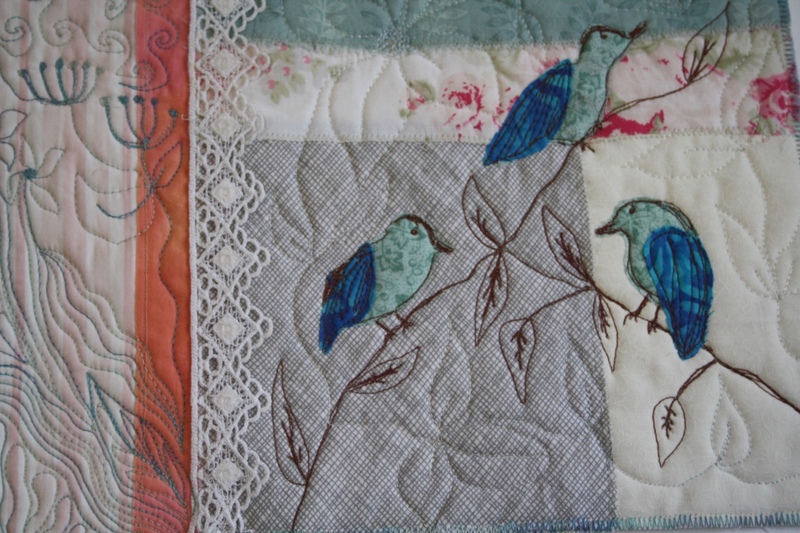 A mixture of old and new embroidered table-cloths, patchwork quilts, wall-hangings, bunting made together with the 'hens' over a glass of wine and the result is casual country style. Perfect backdrop for the organic feast and dancing that followed. Great memories! This simple arrangement of Sweetpeas and Sweet Williams in a jam jar is my starting point for a colourful lapquilt. Watch this space for signs of progress. But I warn you..... it may take a while!! Delighted that some of my work is available for sale in this beautiful interiors store in the heart of Claregalway (next to Supervalu). Pop in and take a look at the gorgeous selection of gifts available. 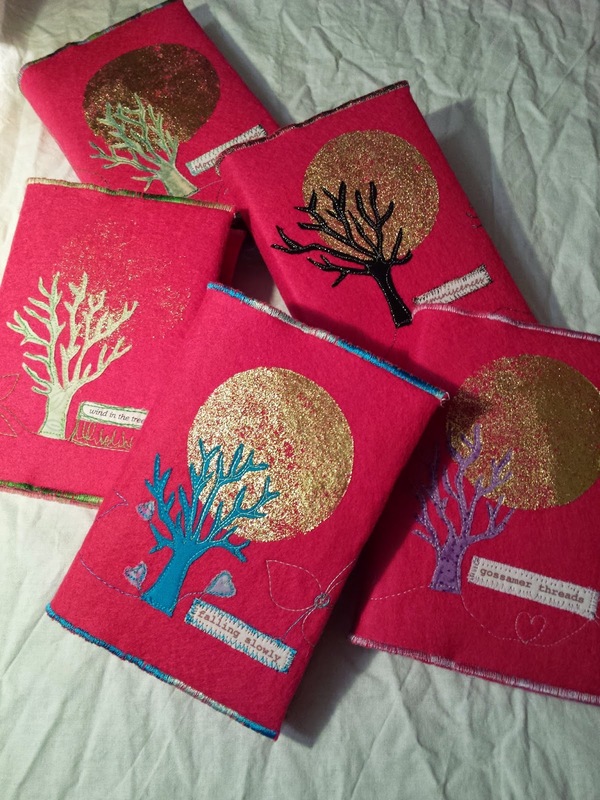 Just some of the new notebooks on their way to Galway Crafts and Collectables in the Corbett Court Shopping Centre, Galway this week. This is a great shop with some lovely handmade gifts from Galway makers. Pop in for a look! 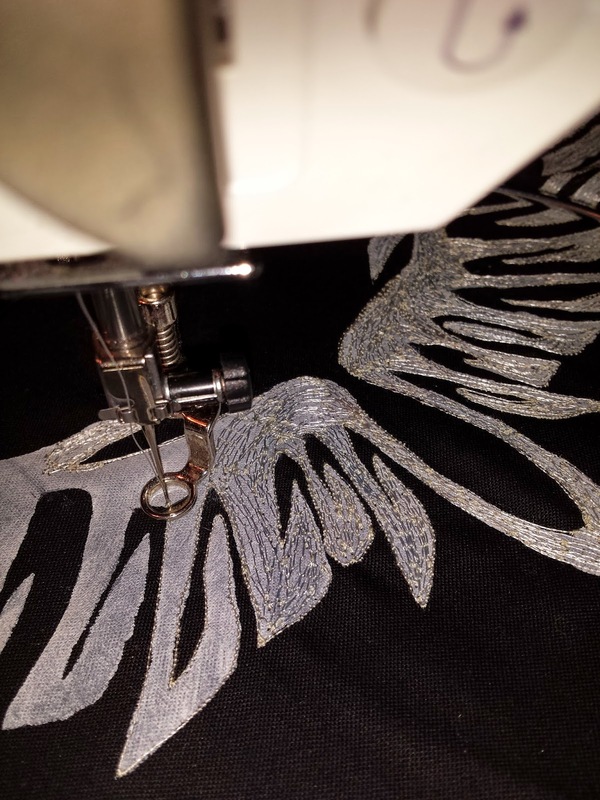 A little bit of stitching on a stencilled image of wings for a computer game lover. Another pillow for my favourite movie-fan. We're on a bit of a roll now! 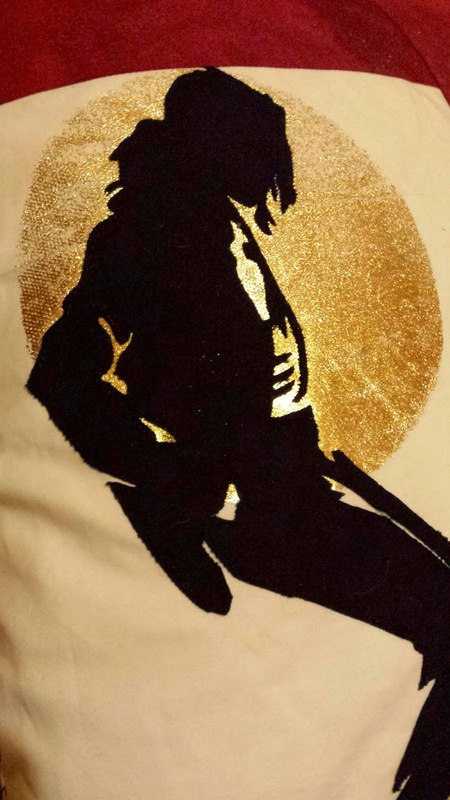 A small pillow project completed for my favourite Michael Jackson fan! 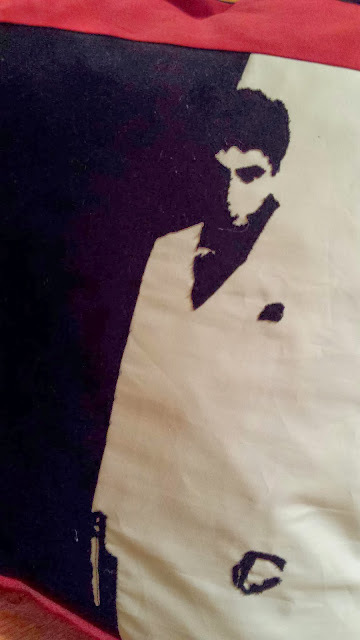 Fusible appliqué, foiling, Thriller lyrics printed on fabric. Enjoyed making it and the research... i.e re-watching those iconic videos and dance moves...Owww! 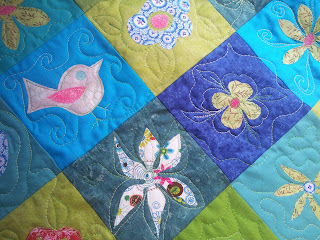 Quilt in progress...machine appliqué, free-motion machine quilting, 100% cotton fabrics, approx. 40inch square. 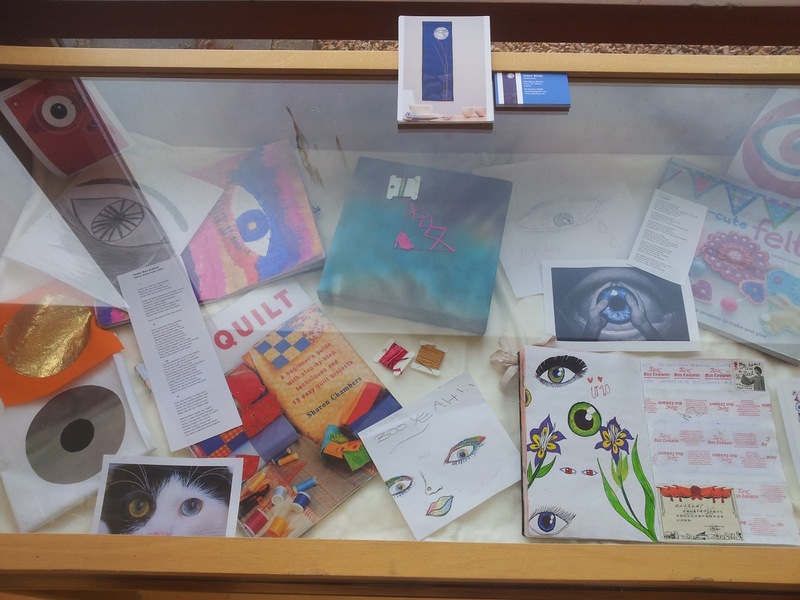 The Junior Certificate School Programme provides secondary school students with an opportunity to collaborate with a local artist in the classroom. I was very happy to accept an invitation to work with Junior Certificate students at Presentation College Galway to share some textile skills with them. We started the project with a visit to an exhibition of craft entitled 'Modified Expression' curated by the Crafts Council of Ireland at the Galway City Museum. The students received blank sketchbooks to record their observations and reactions. 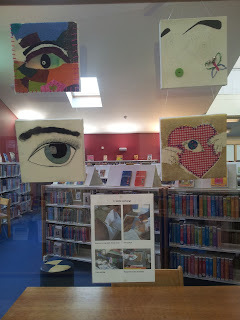 We decided to take our inspiration from references to eyes in proverbs, literature and popular culture to create a series of textile art pieces. Following a series of workshops on fabric painting, fusible appliqué and hand-stitching the students created 8x8inch blocks which can be exhibited individually, in groups or all together. We are delighted that the Westside Library is hosting an exhibition of the work completed during the project in their reception and project room. 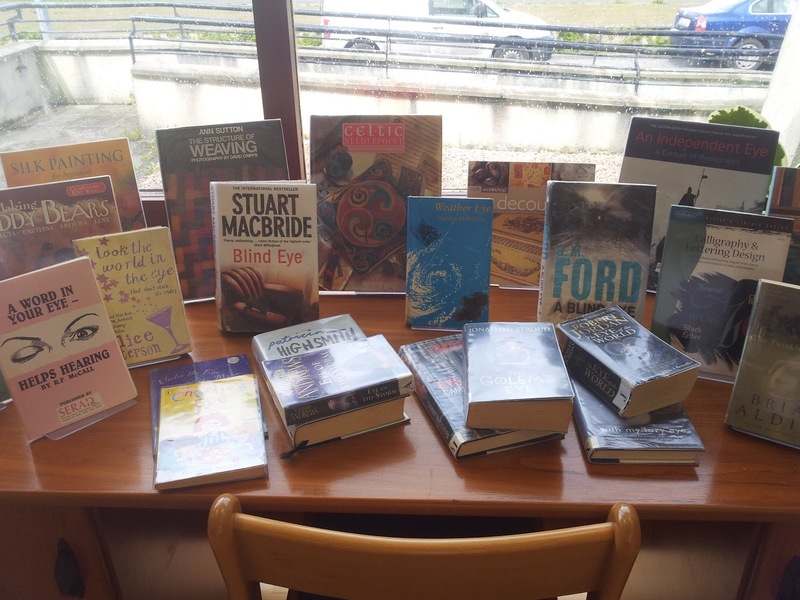 Cora and the library staff added a further dimension to the project by creating links between the students' work and a selection of books from the library. 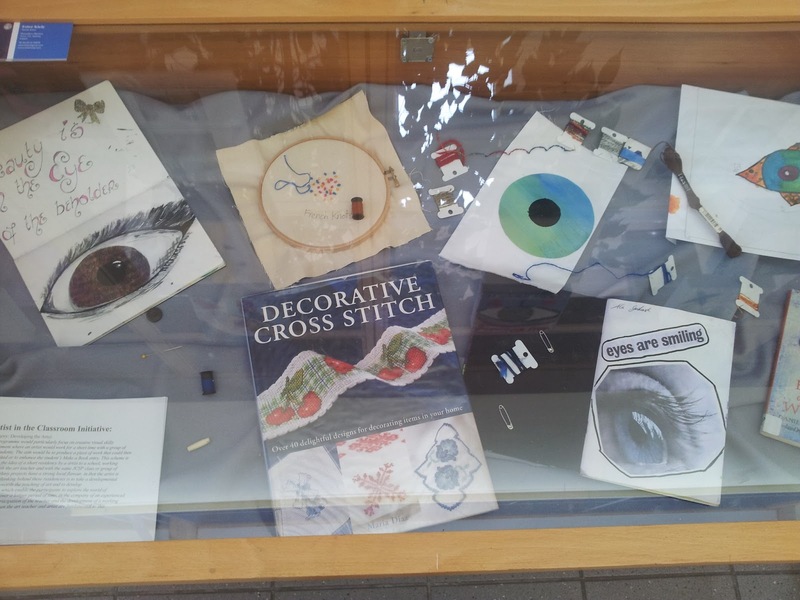 The exhibition will run until the 14th of June, so pop in and take a look at the display of textile art, stitch samples, sketchbooks, research, photos and more by these young artists at the Westside Library, Galway. The CRAFTed project is supported by the Crafts Council of Ireland and the regional Education Centres to bring craft-makers into primary schools to share their skills. 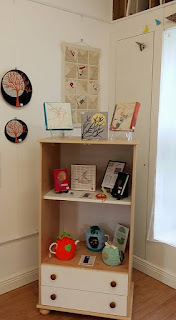 I was delighted to be invited to work with 2nd and 3rd class pupils (8-9yrs) to create a textile artwork based on the theme of Spring and New Growth. The children were given a selection of blank, empty containers to create a 3D assemblage on the theme of Spring. Think out of the box, invent, try out ideas and just see what happens! We discovered colour-theory by mixing 3 primary dyes to create 3 secondary colours. We dyed cotton fabrics to use in our wall-hanging. We cut out plant and animal shapes from our dyed fabrics and used 'Bondaweb' to fuse our shapes to a background fabric. The pupils decided on the layout and design of their wall-hanging. 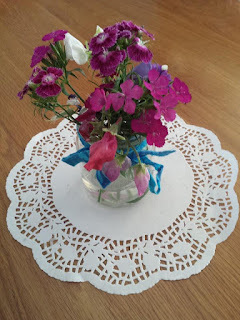 They enjoyed learning how to hand-sew and gather their stitching to make 3D flower shapes. 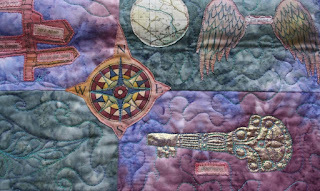 Machine quilting, a hand-woven Sun and a 3D flying bird gives further dimension to the finished wall-hanging. These pupils can feel justly proud of their wonderful wall-hanging which will be displayed at their school for many years to come. 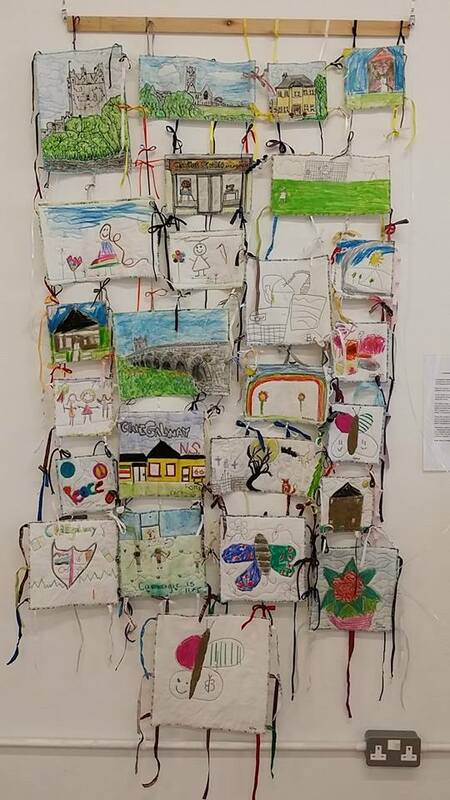 But you can also take a look at their work if you visit the International Quilt Festival of Ireland in Galway from 7th to 9th June, 2013, as the wall-hanging will be exhibited as part of the 'Playground' exhibition of children's work. See www.iqfoi.com for more info on this wonderful festival. ....to my website. I hope you enjoy the latest news on my activities. Don't forget to find me on Facebook at 'Ester Kiely, Textile Artist' and like my page to receive updates directly to your newsfeed. Or contact me at esterkiely@gmail.com. 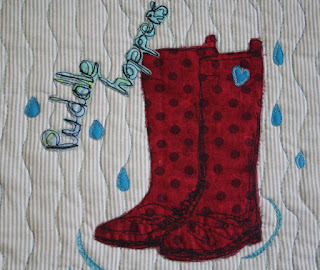 Shop: Click to see current work for sale. 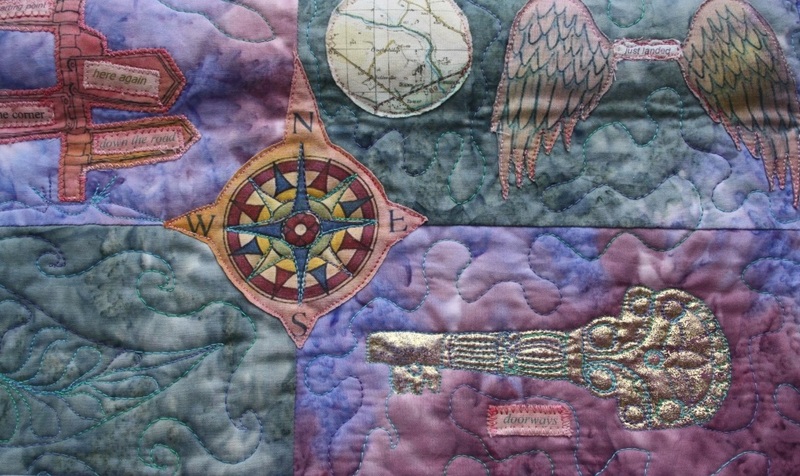 Series of silk wall-hangings with free machine embroidery, quilting and foil. Integrating art - promoting creativity?